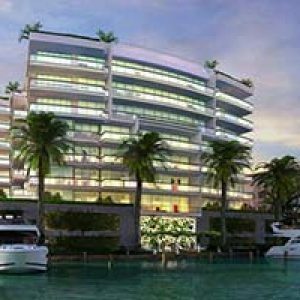 The Estates at Acqualina Towers luxury residences, a project by the Trump Group, is expected to be complete in 2017. It is being built right on Collins Avenue in Sunny Isles Beach, a friendly and high-class town that extends along miles of stunning, white sandy beautiful beaches.The Estates at Acqualina is being developed on over 5 acres of prime beachfront property, the site of the former Golden Strand Ocean Villa Resort condo-hotel. The development will consist of two 51 story towers, each with 95 luxurious residencies, which makes for 190 total luxury residences between both towers, with only spacious 2 residences per floor.Luxury residences available include 3,4,5 and 6 bedroom furniture ready suites ranging from 2,800 sq ft to 13,000 sq ft with an expected pre-construction price range of $3.9 to $40 million. One of the exceptional features of The Estates at Acqualina in Sunny Isles is that every luxury residence will be fully furnished, saving you the time, costs and aggravation of furnishing. Work closely with renowned interior designers and select tasteful furniture and fittings that suit your needs while paying close attention to detail and style. You’ll have the ability to create a home that is uniquely yours. Milano Grandiose, is a 6 bedroom, 5.5 bathroom luxury unit with a Grand Salon, Family Room, Spa, Sauna, and Summer Kitchen. The 6,780 square foot masterpiece has 1,700 beet of terrace space that wraps entirely around the unit, providing outdoor access from any place in the home. The unit features and expansive private lobby and foyer entrance, and an expansive 25×31 foot great room to greet your guests. The sunken living room and his and her bathroom suites provide the best in luxury living. Milano Superiore provides 5 bedrooms and 5.5 bathrooms and 6,780 total square feet of living space. Nearly identical to the Milano Grandiose in space, and floor plan, the Milano Superiore has one less bedroom and bit more space across communal living areas. The unit contains the same open Grand Salon, Family Room, and Kitchen floor plan and an expansive room to greet your guests. Toscana, named after the elegant beauty Italy is known for, features 3 bedrooms and 4.5 bathrooms in addition to a Grand Salon, Family Room, Spa, Sauna, and Summer Kitchen. The unit is 6,015 total square feet with a wraparound 1,550 square foot outdoor terrace area. 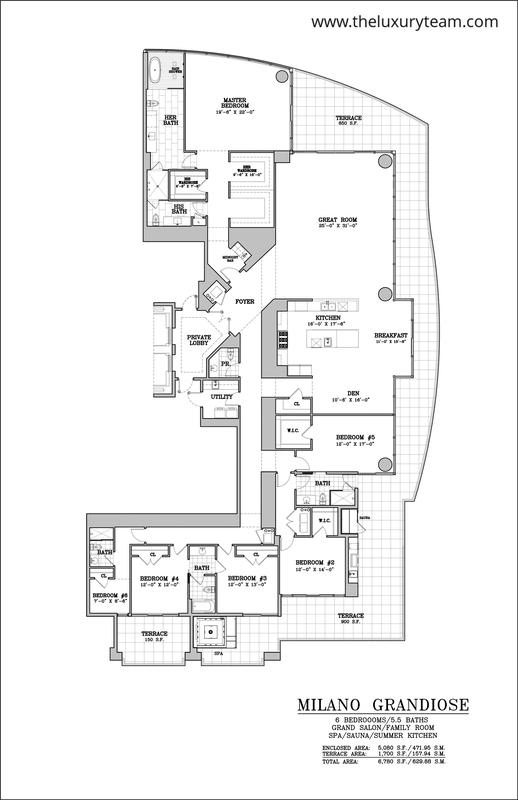 Toscano Classico is the epitome of single family luxury residences in South Florida. 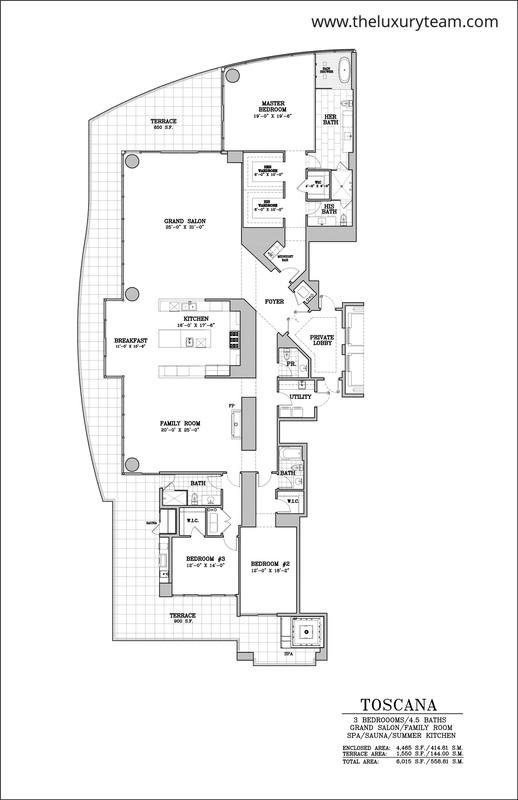 This 4 bedroom, 4.5 bathroom luxury suite features 6,015 total square feet as well as an expansive 1,550 foot terrace area. All bedroom feature private bathroom quarters and the entrance is an expansive private foyer and lobby area, extending from the unit’s private elevator entrance. Thanks to the placement of The Estates at Acqualina in Sunny Isles, residents can expect spectacular views of the Atlantic Ocean and western bay where they can experience beautiful sunsets. Enjoy outdoor living with wrap-around balconies that range in size from 1,550 to 1,700 square feet. Relax in your own private hot tub that includes massaging jets and a waterfall, or in your private outdoor sauna. Entertain friends outdoors with your outdoor summer kitchen with an under-the-counter fridge. The Estates at Acqualina luxury complex will include a 50,000 square foot, 3-level Mediterranean-styled villa located between the two towers. This villa will offer a wide range of amenities including a theater, restaurants, gym, ice skating rink, bowling lanes, billiards room, and a full service spa. The best of entertainment is available right on site! Other amenities include 8 infinity pools surrounded by private gardens and grounds with lush beautiful landscaping. More details about building amenities will be available as the plans develop. International airports in Miami and Fort Lauderdale are just minutes away, and there is easy access to both I-95 and US-1. Don’t miss your chance to be part of this luxury community, units are selling fast! What entertainment is around the Estates At Acqualina? The Estates at Acqualina is located close to a variety of terrific dining, shopping, and entertainment outlets. This South Florida town is just north of Miami Beach and south of Aventura and Hallandale Beach, so there’s no shortage of access to great beaches. You can see the Estates by visiting: 17885 Collins Ave, Sunny Isles Beach, FL 33160. Entering without a membership or appointment may not be possible. Make sure you speak to our agents about viewing condos for sale at the Estates at Acqualina. What if I have more questions about these condos? The Luxury Team can answer any remaining questions you have about these condos, and help you arrange a visit so that you can explore some of these floorplans and find out if they’re right for you.